It's time for a new challenge at STAMPlorations, and this month it's all about stamping and your favourite technique. Our guest designer for the challenge is Sian. My current favourite technique is water colouring - and splatting. What, you hadn't noticed?!? For this card, I made a pale yellow background then while it was still wet, stamped the images which then bled into the wet areas. Once dry, I then overstamped the images and added highlights with coloured pencils. Oh, and some splatter. Love splatter. The winner will receive 2 clear stamp sets of her choice from the Vignette, Patchwork Frenzy, and Subway Art series. (Visit the shop to see the available stamp sets.) Also, the winner will be invited to be a Guest Designer. The challenge is open until 30 April - come and join us! I got to meet my STAMPlorations teamie Monika at Port Sunlight on Saturday - we met up at the little cafe and oohed and aahed over each other's purchases :) Monika's bag is strategically placed to hide the rubbish from the stall at the back of us! How fab you got to meet IRL! I really like the way the butterfly looks like it is fluttering! And yes we do love splatters! Well, I won't ever tire of seeing your watercolor and spatter/splatter cards, Shirley! Love the dreamy look you created on the butterflies and flowers on the panel. And WHEEEEE!!! Awesome photo of you and Monika! Love that you two got to meet and show each other's hauls! Such a pretty soft effect! Two fabulously talented women enjoying each other's company .... ah, life is great! 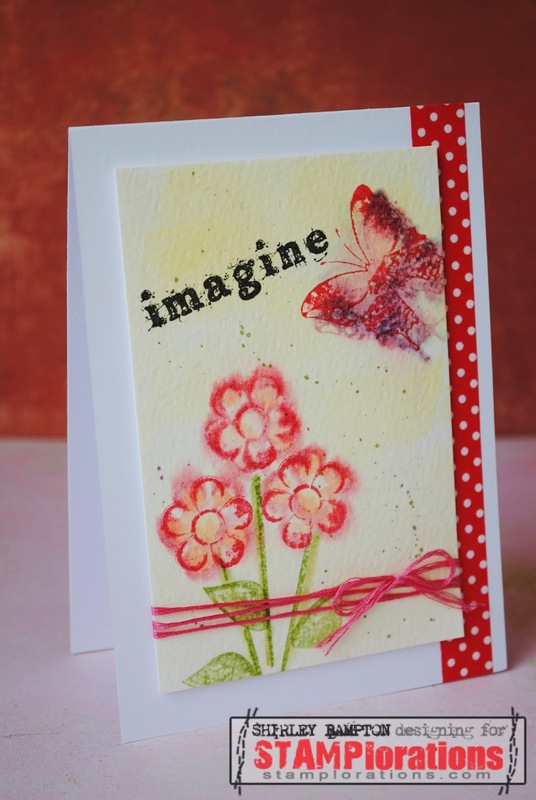 I'll never grow tired of your water coloring and splatters...your card is just beautiful, Shirley! How fun that you got together with your friend...bet you had a great time! That is the most delicate splatter I've ever seen. Love the dreamy card. And that you had face time!!! What a gorgeous watercolour card Shirley! So soft and pretty. My attempts at watercolour always end up a muddy mess! I enjoyed seeing your Port Sunlight pictures - I was there too and came home with more than I intended! So pretty love the dimension on your card - how fun to meet up another teamie! This is so beautiful! I love the watercolour effect - I really have to dig out my paints, you guys are so inspiring!